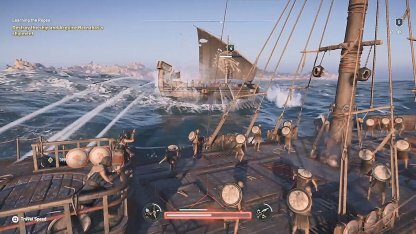 Explore the open seas and bring down enemy ships with your crew! 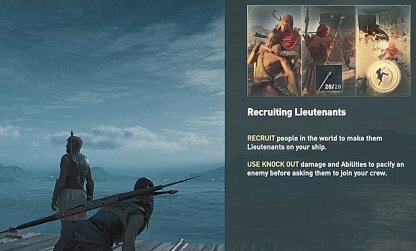 Learn all about naval combat, ship customization, recruiting crews, and more in this guide. Positioning your ship is crucial in landing shots to enemy ships and evading attacks. Circle around enemies and stay at the stern of the enemy's boat as you prepare to attack then steer to their side! Rain fire to your enemies by setting your javelins and arrows on fire! This will add more damage to your shots and will make bringing down enemy ship and crew a bit more faster. See your enemies preparing to shoot a volley of arrows at you? Steer your ship away then circle back with a counter attack. Always be aware of what the enemy crew is doing to act accordingly! For faster moving ships, try to predict and aim your attacks to where you think the enemy will be. This is because it takes time for your arrows, and javelins to travel to far away targets. The main way you can damage ships is to ram at them. 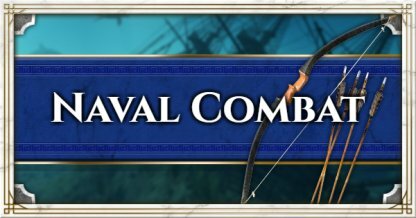 Predict the path of the enemy ship and adjust your course to catch them right at their bow! 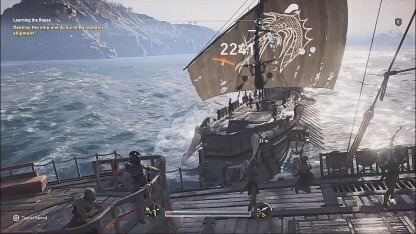 Alternatively, you can board ships to take on the enemy crew personally and grab their loot. Make sure you're up for a fight or you might get overpowered by the desperate crew. Hull Hull Upgrades increases your armor and health allowing you to last longer at sea! It also unlocks slots to where you can assign your lieutenants, for added perks and bonuses to your ship! Arrow Volleys, & Javeline Throws Decreasing your reload times and firing speeds with these upgrades allows you to constantly fire at the enemy, not giving them a chance to breathe! Arrow & Javeline Damage Increase your weapon damages to hit harder, and make quick work of enemies in the sea! Fire Brazier This will add a new way to damage your enemies. You can light up your arrows and javelins to make your volleys damage the enemy over time! Crew Armor Increasing your Crew Armor will reduce the amount of damage you take when you brace using the ship. By combining this with an upgraded Hull, you may be near impossible to sink! Increase your ship's endurance and your overall damage by upgrading different aspects of your ship! Take note that upgrades need materials and money to get. Increase the time between your Javelin and Arrow shots by upgrading your Arsenal options. You can also unlock fire arrows and javelins here. 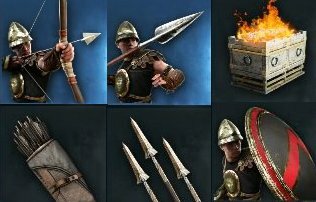 Upgrades in this category will increase the damage your arrow, javelins, and ramming will do. If you have a more offensive gameplay, it would be best to increase these first! 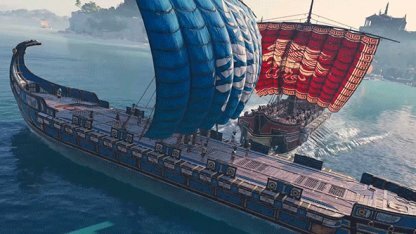 Make your ship a stronghold by increasing its overall endurance! Getting upgrades to your crew will also improve their armor and survivability in combat. You can recruit up to 4 allies to become part of your crew as Special Lieutenants. Each Lieutenant will have perks that can benefit your ship, such as additional ramming damage or arrow damage. You can only assign one Lieutenant when you first get your ship. You can increase the number of slots for Lieutenants by upgrading your hull! Change the way your ship and crew looks to your liking with ship customizations! The Ship Look will change the overall look of your ship, from the color of its wood to the design of its sails. Manage how your whole crew will look by assigning a uniform for all of them! 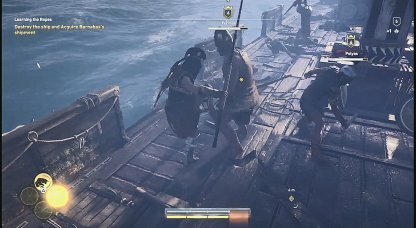 The Figurehead at the bow of your ship can also be change depending on how you would like it! What Can You Do With Your Ship? 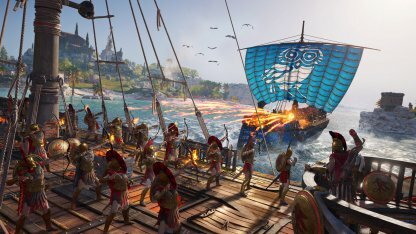 There's no stopping you from attacking every ship you meet a sea whether they're pirates, merchants, or even certain factions. Just remember that attacking civilians and factions can get you a bounty. 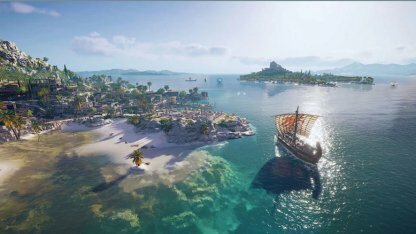 Take your ship to open seas and discover new locations and islands. 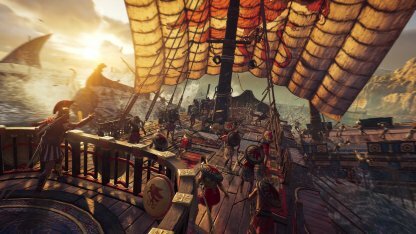 Use Ikaros to survey the sea before you for any treasures of points of interests as you sail. 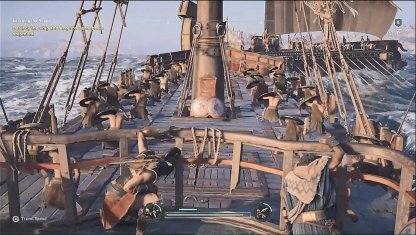 Your allies will join you in journey at sea with no questions asked. You can have 4 of your allies join and shift them around if you'd like. Mercenaries can also join your crew! 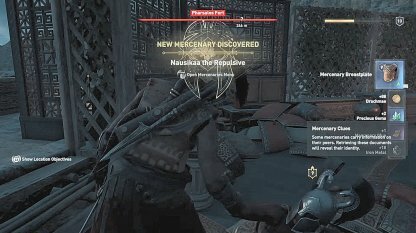 Instead of killing them off, use a non-lethal finishing move like the Spartan Kick to get the option to befriend them. 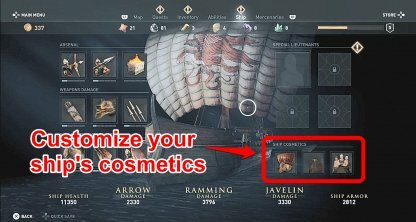 Store up to 350 items in the Ship Storage found in the hull of Adrestia near where you stand when you take command of the ship. 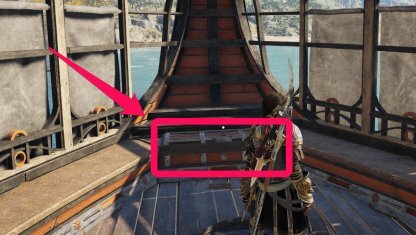 The items will remain there until you retrieve them at another time. 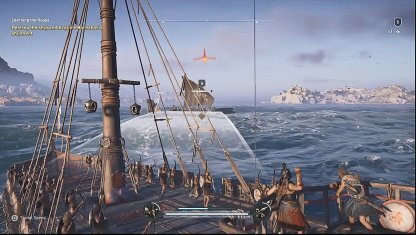 You'll need to advance through the story first before you could unlock your ship. You can only access it once you meet Barnabas at the docks at the end of Episode 1.